At approximately 36" x 28", our beautifully whimsical mermaid riding the waves is a wonderful addition to any home, office, or coastal restaurant. This amazing aluminum metal wall art is a non rust metal making it suitable for indoor or outdoor use. 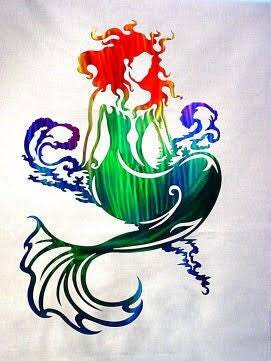 Have a daughter who is in love with the fantasy of mermaids? This piece would be a delightful addition of mermaid decor for your girls room. Perhaps you've been on the prowl for nautical ocean decor that would suit outdoor placement. Look no further! Our mermaid is first plasma cut from aluminum. For those of us familiar with the salt air, we know what salt can do to steel over time. That's why we've created our metal ocean decor using aluminum rather than steel. Aluminum reacts to the elements differently and is therefore not susceptible to rust. Additionally, aluminum is much more light weight than steel counterparts, putting less load on your walls. Although aluminum doesn't weigh as much, this does not speak to the durability of this metal. With no rusting, easy hanging ability, and long term durability, our aluminum metal home decor makes a perfect addition for indoor and outdoor use. Your personalized piece will then be sanded and ground by hand. Grinding the metal allows the beautiful addition of depth and dimension to your piece. After grinding is complete, your mermaid will then be airbrushed to add a lovely splash of color wherever she hangs. 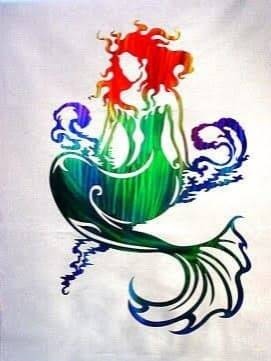 This mermaid wall hanging is colored with a special dye that adheres to metal giving a translucent color. The aluminum is then powder coated to protect the surface and to give a shiny, beautiful finish. Powder coat is a thick, sturdy material used to protect outdoor furniture, machinery, even household appliances. We find that powder coating offers more reliable protection for our pieces than paint. Shipping quotes are calculated using USPS posted rates. On some of our larger pieces however, we utilize the safest, and least expensive shipping options using multiple carriers. When we are able to reduce the shipping costs, those savings are refunded right back to you! We are so grateful for our customers and your happiness is our number one priority. We are bringing back the lost art of great customer service one order at a time. You work hard for your money and you deserve to be treated as well as possible when you make the choice to spend it. We SEE you and APPRECIATE each and every one of you! All of our items are made here in Florida at our family run shop. All metal we procure is sourced from US factories. Quality is our #1 concern when it comes to our products. Please note that each item is hand painted by me and may differ slightly in color. Since each piece is created to order, each piece is truly one of a kind. We do all we can to make them as close to our photos as possible.